No business wants to interrupt its operations when performing updates to processes or system migration. Especially when the business in question is one of the leading banks in the Nordic Region, where the integrity of e-services and client satisfaction are vital for banking business. Read on our success story how Infopulse helped their customer to update its legacy systems to the latest top-notch technologies without stopping banking operations and processes. Banking markets in the Nordic Region are quite concentrated and have several dominant banking groups, well known for actively implementing new technologies. After the banking crisis of the late 80’s and early 90’s, rising technologies became a saving hand for the banking sector. Banking Industry is now undergoing Digital Transformation, evolving rapidly and creating a variety of additional delivery channels. This allowed banks to transfer many services from physical branches to online anytime/anywhere-available services. While physical branches are still important for banking, it has become critical for the banking business to keep their e-services working and updated as unavailability of the digital services exposes banks to a risk of losing their clients. Our customer (name under NDA) is the market-leading Bank that provides its services throughout the whole Nordic Region. The Bank has a constantly expanding regional presence through 120 outlets in Sweden, Finland, Denmark, and Norway. They offer a wide range of banking services, such as deposits, loans, payment & transaction services, credit and debit cards, currency exchange and money transfers for almost a century. Being well versed with all of the customer’s systems and their interactions, Infopulse detected numerous network issues during our long-term cooperation. E.g., most internal systems were located on the same network, making access to them inseparable on the network level. We launched a project to migrate the customer’s infrastructure to the new ESN data center. Instead of simply transferring the old infrastructure, we offered a brand new solution, which allowed to eliminate all existing weaknesses and to group systems according to the functional purposes and safety requirements. Our customer had several essential requirements for this project: all systems had to be transferred simultaneously, with the new design being already in place. Moreover, it was of vital importance that all bank processes had to stay up without interruptions. 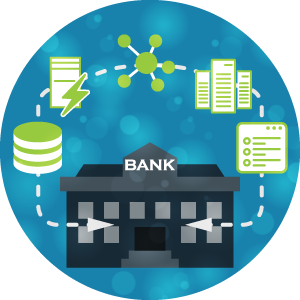 We had to provide the continuous work of all bank services while performing the migration. To do that, the Infopulse team needed to implement fundamental changes to the whole bank infrastructure and to the most of the customer’s services, while dealing with ongoing challenges along with our primary task. Infopulse Server Backup team and Virtual Platform team started moving legacy virtual servers in September 2015. The selected new data center had many advantages: SLA level of 99.99% uptime, opportunity to add extra equipment without an outage, high-level security, power usage effectiveness, additional data backup etc. 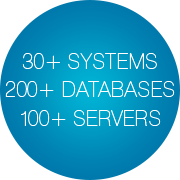 In total, we transferred 30+ different systems, 100+ servers, and over 200 databases. Almost all data center tasks were automated with the help of Ansible Tower. We also used Cisco Security Manager for firewall management. Additionally, with a new Disaster Recovery solution, we made it possible to restore the whole customer’s infrastructure within just 24 hours in case of a system collapse. To set up the Disaster Recovery solution, the Infopulse team had to implement a unique network infrastructure, uncommon for our clients’ systems. This network infrastructure allows to create clusters on the application level and to replicate data into Disaster Recovery data center in real time without affecting security. For the proper implementation of our DR solution, we needed to alter databases configuration – a rather complicated task, as in the meantime we had to keep all of the customer’s systems up and running. New systems design allowed us to install a wide range of extra effective systems. After the project delivery, Infopulse started setting up the transparent proxying, DDoS attacks detection system, and a vulnerability scanner. Additionally, Infopulse implemented a new incremental backup and restore system, which can recover all data on any of the customer’s systems. These solutions, which we at Infopulse have been developing for quite some time already, will improve the banks’ systems protection against network security threats, such as cyberattacks, malicious actions, malware etc., eliminating any effect on the confidentiality, integrity, and availability of the critical business data.